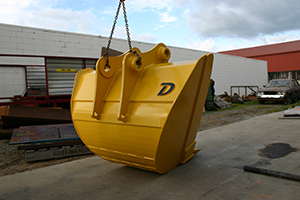 The Doherty Engineered range of standard Cleaning Buckets are a result of extensive field research. 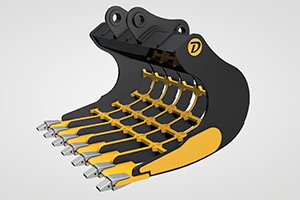 The design ensures minimal bucket to product contact when digging which substantially increases bucket life. The use of horizontal wear strips on the curved floor and the selection of wear resistant steels result in a bucket design which has minimal wear and maximum life. Doherty cleaning buckets are available as a direct mount or Powerdig series. Direct mount models are fitted with traditional mount ears and bosses for use with removable pins. The Powerdig series is designed for use with a quick coupler. The mounting pins are recessed into the main head bean of the bucket to ensure a short tip radius and maximum breakout. The Powerdig series are only suitable for use with a quick coupler as the mounting pins are welded into the bucket. 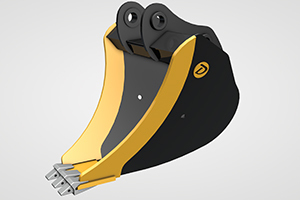 The Doherty range of Riddle Buckets has been designed for heavy-duty rock and mineral processing applications. 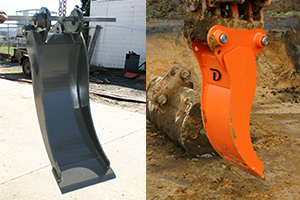 We have designs suitable for 6 to 60 tonne excavators and tyne spacings can be tailored to suit individual customer requirements. 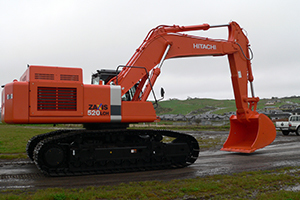 These field proven attachments are operating in mine sites and quarries in New Zealand and the Pacific Islands. Call us with your requirements we will be happy to provide a general arrangement drawing and a no- obligation quote. 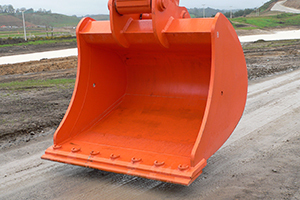 Ripper Buckets are out-performing conventional units in heavy-duty quarry work. This combination of established design and local application knowledge ensures maximum bucket life and minimal down time. 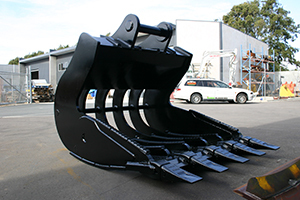 Doherty Engineered Attachments have developed a range of Spade Buckets for use in precision trenching operations. They are also ideal for use with sticky materials which tend to build up in a conventional bucket shell. A feature of the Spade range is the ability to fit wider inserts to the base Spade Frame which is normally the narrowest width available. This means that there is no need to go to the expense of purchasing a complete new spade to dig a wider trench – just buy the appropriate insert which quickly bolts onto the base unit. In order to keep the changeover process as simple as possible Doherty’s have designed a simple two bolt attachment on the protected back side of the insert. Other brands typically use a bolt through the cutting edge but these are prone to damage making changeovers slow and frustrating. 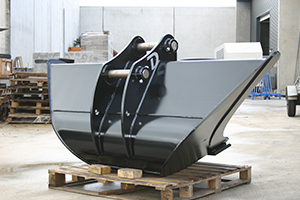 Vee Buckets are a highly efficient tool for establishing and maintaining open drains. 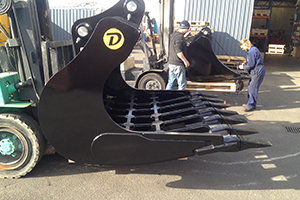 Doherty’s have incorporated the special features of the doherty powerdig to provide a top performing Vee Bucket, which discharges easily and consistently out performs other types. Available from 5 to 50 tonne.